Current and past writings are posted here from time to time. They are selected for their general interest for different groups likely to visit this site. These are pdf files and require Acrobat Reader to open. Adult Spiritual Growth - Here I managed to get the essence of Archetype of the Spirit into a 25 minute sermon. Where you find the large X I asked the congregation to stand to show the embodied nature of the archetype with Earth (SF) beneath their feet, Sky (NT) at their head, Sun (ST) at their right, Moon (NF) at their left and of course the Tree of Life, the human spine, integrating the whole. Darwin at 199 - As the Darwin bicentennial approached I had some concerns to address to the Unitarian Universalist movement. 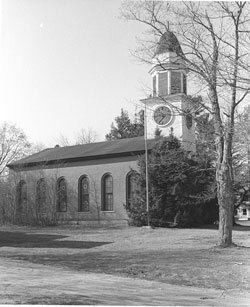 History, First Baptist Church in Thomaston, ME - Not only did my great great grandfather, Rev. Joseph Kalloch, serve this church but there is great theological interest in the story of its early ministers for both Baptists and Universalists. The Story of Maine’s Oldest Sunday School - Children learn differently than adults. Here is a story of the emergence of adult awareness of this! It was an attempt to leave something for the collective memory in Kennebunk after I received a call to ministry with the UU Congregation in Andover, MA. I think it has a general interest as well. Universalists and Unitarians In Kennebec County, ME - The State of Maine has 16 counties. Here is a description of the Universalist and Unitarian congregations which have convened in one, Kennebec County. I am researching and writing of all 16 with an essay describing the dynamics and influences of these religions in the state. The project includes about 240 images of church buildings so far. In Support of the Right to Choice - This is a sermon preached during a time when Roe v. Wade was being challenged. 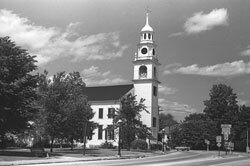 Later the same year on Nov. 12, 1989, the First Parish in Kennebunk was selected to be the sunrise event for Mobilize For Women’s Lives. The sermon was distributed to the estimated 2500 persons who attended. Avenues for Religious Freedom - This paper was written for Commissions 1 & 2 at meetings of the World Congress of the International Asssociation for Religious Freedom held in Kochi, India, September 4, 2010. IARF is the world’s oldest multi-faith organization, founded in 1900. Meeting house of the First Parish Unitarian in Kennebunk as it is today. Nov. 12, 1989. Photo by E.M.R.